I can remember writing in the ’90s and early 2000s that one of the great things about the United States was our economic mobility. By that term, economists mean the ability of people to shift around on the economic spectrum – to move from being a low-income family to being a high-income family, for example. Karl Marx, in the 1850s, even cited the US as an exception to his struggle-of-the-classes theory, because the economic classes in the US kept changing so much. The last few years have seen a flurry of studies asserting that this mobility is no longer the case. That is a very uncomfortable fact for me – it cuts right into my emotional comfort zone. If that is true, then the America I grew up in is changing. Which of course should not surprise me because (a) the US is always changing and (b) the evidence in front of my eyes about cultural shifts and the economic difficulties of the younger generation is readily apparent. An old friend of mine sent me the essay you’re about to read. It’s by Frank Buckley, who is a professor at the Scalia Law School at George Mason University. It appeared in the Hillsdale College publication Imprimis. Outside the Box is supposed to make you think, even when it is uncomfortable to do so. And Buckley’s essay will make many Americans uncomfortable, even as it allows my Canadian friends to continue to feel smug and superior (although they are always too polite to flaunt it). That is the country in which some imagine we still live, Horatio Alger’s America – a country defined by the promise that whoever you are, you have the same chance as anyone else to rise, with pluck, industry, and talent. But they imagine wrong. The U.S. today lags behind many of its First World rivals in terms of mobility. A class society has inserted itself within the folds of what was once a classless country, and a dominant New Class – as social critic Christopher Lasch called it – has pulled up the ladder of social advancement behind it. Then he makes me decidedly uncomfortable. He goes right to the research and demonstrates that the United States is way behind most of the rest of the developed world in terms of economic mobility. The irony is that much of the reason for this lack of mobility is what we consider to be “progressive” policies, although our conservative policies are also exacerbating the situation, or at least seem to be doing so in comparisons with other countries. Buckley’s prescription? I’ll let him develop his argument for you, rather than spill the beans. I hold it that a little rebellion, now and then, is a good thing, and as necessary in the political world as storms in the physical. Our dinner with Jeff Saut (the Chief Investment Strategist at Raymond James) Sunday night was fabulous, and the conversation was wonderful. Jeff has spent a very long career (we are the same age) very successfully and publicly picking stocks. While Jeff and I have been friends for many years, I have never really asked him about his investment process, and over steaks and mushrooms I took the opportunity. He gave me a number of examples of his process over the years. 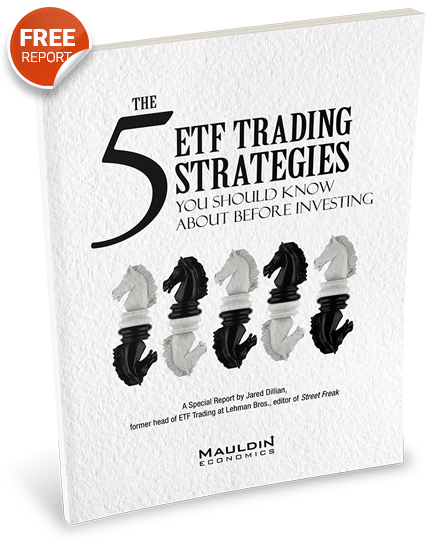 What it boils down to is that he hangs around with incredibly good stock pickers and gets them to share their ideas, and then follows up with his own research. I began to ask, well, who did you get this from, and how did it come about that you got to meet him? After about an hour of this, I turned to Shane and said, “You have just witnessed one of the greatest instances of name dropping that you will ever encounter.” Jeff was only doing it in response to my questions, and I knew he was connected – but dear gods, he has a network that is phenomenal. It’s like he has a direct pipeline to the gods of investing. Part of it is that, like me, he has hung around for 67 years, is a nice guy who meets a lot of people, and is willing to share his ideas freely. I am trying to figure out how to get him to my conference. America was an exception to Marx’s theory of social progress. By that theory, societies were supposed to move from feudalism to capitalism to communism. But the America of the 1850s, the most capitalist society around, was not turning communist. Marx had an explanation for that. “True enough, the classes already exist,” he wrote of the United States, but they “are in constant flux and reflux, constantly changing their elements and yielding them up to one another.” In other words, when you have economic and social mobility, you don’t go communist. One can measure these things empirically by comparing the correlation between the earnings of fathers and sons. Pew’s Economic Mobility Project ranks Britain at 0.5, which means that if a father earns £100,000 more than the median, his son will earn £50,000 more than the average member of his cohort. That’s pretty aristocratic. On the other end of the scale, the most economically mobile society is Denmark, with a correlation of 0.15. The U.S. is at 0.47, almost as immobile as Britain. A complacent Republican establishment denies this change has occurred. If they don’t get it, however, American voters do. For the first time, Americans don’t believe their children will be as well off as they have been. They see an economy that’s stalled, one in which jobs are moving offshore. In the first decade of this century, U.S. multinationals shed 2.9 million U.S. jobs while increasing employment overseas by 2.4 million. General Electric provides a striking example. Jeffrey Immelt became the company’s CEO in 2001, with a mission to advance stock price. He did this in part by reducing GE’s U.S. workforce by 34,000 jobs. During the same period, the company added 25,000 jobs overseas. Ironically, President Obama chose Immelt to head his Jobs Council. According to establishment Repub­licans, none of this can be helped. We are losing middle-class jobs because of the move to a high-tech world that creates jobs for a cognitive elite and destroys them for everyone else. But that doesn’t describe what’s happening. We are losing middle-class jobs, but lower-class jobs are expanding. Automation is changing the way we make cars, but the rich still need their maids and gardeners. Middle-class jobs are also lost as a result of regulatory and environmental barriers, especially in the energy sector. And the skills-based technological change argument is entirely implausible: countries that beat us hands down on mobility are just as technologically advanced. Folks in Denmark aren’t exactly living in the Stone Age. This is why voters across the spectrum began to demand radical change. What did the Republican elite offer in response? At a time of maximal crisis they have been content with minimal goals, like Mitt Romney’s 59-point plan in 2012. How many Americans remember even one of those points? What we remember instead is Romney’s remark about 47 percent of Americans being takers. That was Romney’s way of recognizing the class divide – and in the election, Americans took notice and paid him back with interest. Since 2012, establishment Republicans have continued to be less than concerned for the plight of ordinary Americans. Sure, they want economic growth, but it doesn’t seem to matter into whose pockets the money flows. There are even the “conservative” pundits who offer the pious hope that drug-addicted Trump supporters will hurry up and die. That’s one way to ameliorate the class struggle, but it doesn’t exactly endear anyone to the establishment. The southern writer Flannery O’Connor once attended a dinner party in New York given for her and liberal intellectual Mary McCarthy. At one point the issue of Catholicism came up, and McCarthy offered the opinion that the Eucharist is “just a symbol,” albeit “a pretty one.” O’Connor, a pious Catholic, bristled: “Well, if it’s just a symbol, to Hell with it.” Likewise, the principles held up as sacrosanct by establishment Republicans might be logically unassailable, derived like theorems from a set of axioms based on a pure theory of natural rights. But if I don’t see them making people better off, I say to Hell with them. And so do the voters this year. What the establishment Republicans should ask themselves is Anton Chigurh’s question in No Country for Old Men: If you followed your principles, and your principles brought you to this, what good are your principles? Had Marx been asked what would happen to America if it ever became economically immobile, we know what his answer would be: Bernie Sanders and Hillary Clinton. And also Donald Trump. The anger expressed by the voters in 2016 – their support for candidates from far outside the traditional political class – has little parallel in American history. We are accustomed to protest movements on the Left, but the wholesale repudiation of the establishment on the Right is something new. All that was solid has melted into air, and what has taken its place is a kind of right-wing Marxism, scornful of Washington power brokers and sneering pundits and repelled by America’s immobile, class-ridden society. Establishment Republicans came up with the “right-wing Marxist” label when House Speaker John Boehner was deposed, and labels stick when they have the ring of truth. So it is with the right-wing Marxist. He is right-wing because he seeks to return to an America of economic mobility. He has seen how broken education and immigration systems, the decline of the rule of law, and the rise of a supercharged regulatory state serve as barriers to economic improvement. And he is a Marxist to the extent that he sees our current politics as the politics of class struggle, with an insurgent middle class that seeks to surmount the barriers to mobility erected by an aristocratic New Class. In his passion, he is also a revolutionary. He has little time for a Republican elite that smirks at his heroes – heroes who communicate through their brashness and rudeness the fact that our country is in a crisis. To his more polite critics, the right-wing Marxist says: We are not so nice as you! The right-wing Marxist notes that establishment Republicans who decry crony capitalism are often surrounded by lobbyists and funded by the Chamber of Commerce. He is unpersuaded when they argue that government subsidies are needed for their friends. He does not believe that the federal bailouts of the 2008-2012 TARP program and the Federal Reserve’s zero-interest and quantitative easing policies were justified. He sees that they doubled the size of public debt over an eight-year period, and that our experiment in consumer protection for billionaires took the oxygen out of the economy and produced a jobless Wall Street recovery. The right-wing Marxist’s vision of the good society is not so very different from that of the JFK-era liberal; it is a vision of a society where all have the opportunity to rise, where people are judged by the content of their character, and where class distinctions are a thing of the past. But for the right wing Marxist, the best way to reach the goal of a good society is through free markets, open competition, and the removal of wasteful government barriers. Readers of Umberto Eco’s The Name of the Rose will have encountered the word palimpsest, used to describe a manuscript in which one text has been written over another, and in which traces of the original remain. 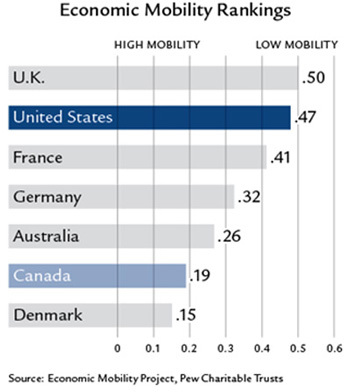 So it is with Canada, a country that beats the U.S. hands down on economic mobility. Canada has the reputation of being more liberal than the U.S., but in reality it is more conservative because its liberal policies are written over a page of deep conservatism. Whereas the U.S. comes in at a highly immobile 0.47 on the Pew mobility scale, Canada is at 0.19, very close to Denmark’s 0.15. What is further remarkable about Canada is that the difference is mostly at the top and bottom of the distribution. Between the tenth and 90th deciles there isn’t much difference between the two countries. The difference is in the bottom and top ten percent, where the poorest parents raise the poorest kids and the richest parents raise the richest kids. For parents in the top U.S. decile, 46 percent of their kids will end up in the top two deciles and only 2 percent in the bottom decile. The members of the top decile comprise a New Class of lawyers, academics, trust-fund babies, and media types – a group that wields undue influence in both political parties and dominates our culture. These are the people who said yes, there is an immigration crisis – but it’s caused by our failure to give illegals a pathway to citizenship! There’s a top ten percent in Canada, of course, but its children are far more likely to descend into the middle or lower classes. There’s also a bottom ten percent, but its children are far more likely to rise to the top. The country of opportunity, the country we’ve imagined ourselves to be, isn’t dead – it moved to Canada, a country that ranks higher than the U.S. on measures of economic freedom. Yes, Canada has its much-vaunted Medicare system, but cross-border differences in health care don’t explain the mobility levels. And when you add it all up, America has a more generous welfare system than Canada or just about anywhere else. To explain Canada’s higher mobility levels, one has to turn to differences in education systems, immigration laws, regulatory burdens, the rule of law, and corruption – on all of which counts, Canada is a more conservative country. America’s K-12 public schools perform poorly, relative to the rest of the First World. Its universities are great fun for the kids, but many students emerge on graduation no better educated than when they arrived. What should be an elevator to the upper class is stalled on the ground floor. One study has concluded that if American public school students were magically raised to Canadian levels, the economic gain would amount to a 20 percent annual pay increase for the average American worker. The U.S. has a two-tiered educational system: a superb set of schools and colleges for the upper classes and a mediocre set for everyone else. The best of our colleges are the best anywhere, but the average Canadian school is better than the average American one. At both the K-12 and college levels, Canadian schools have adhered more closely to a traditional, conservative set of offerings. For K-12, a principal reason for the difference is the greater competition offered in Canada, with its publicly-supported church-affiliated schools. With barriers like America’s Blaine Amendments – state laws preventing public funding of religious schools – lower-class students in the U.S. must enjoy the dubious blessing of a public school education. What about immigration? Canada doesn’t have a problem with illegal aliens – it deports them. As for the legal intake, Canadian policies have a strong bias towards admitting immigrants who will confer a benefit on Canadian citizens. Even in absolute numbers, Canada admits more immigrants under economic categories than the U.S., where most legal immigrants qualify instead under family preference categories. As a result, on average, immigrants to the U.S. are less educated than U.S. natives, and unlike in Canada, second- and third-generation U.S. immigrants earn less than their native-born counterparts. In short, the U.S. immigration system imports inequality and immobility. If immigration isn’t an issue in Canada, that’s because it’s a system Trump voters would love. For those at the bottom of the social and economic ladder who seek to rise, nothing is more important than the rule of law, property rights, and the sanctity of contract provided by a mature and efficient legal system. The alternative – in place today in America – is a network of elites whose personal bonds supply the trust that is needed before deals can be done and promises relied on. With its more traditional legal system, Canada better respects the sanctity of contract and is less likely to weaken property rights with an American-style civil justice system which at times resembles a slot machine of judicially-sanctioned theft. Americans are great at talking about the rule of law, but in reality we don’t have much standing to do so. Then there’s corruption. As ranked by Transparency International’s Corruption Perceptions Index, America is considerably more corrupt than most of the rest of the First World. With our K Street lobbyists and our donor class, we’ve spawned the greatest concentration of money and influence ever. And corruption costs. In a regression model, the average family’s earnings would increase from $55,000 to $60,000 were we to ascend to Canada’s level of non-corruption, and to $68,000 if we moved to Denmark’s level. In a corrupt country, trust is a rare commodity. That’s America today. Only 19 percent of Americans say they trust the government most of the time, down from 73 percent in 1958 according to the Pew Research Center. Sadly, that is a rational response to the way things are. America is a different country today, and a much nastier one. For politically engaged Republicans, the figure is six percent. That in a nutshell explains the Trump phenomenon and the disintegration of the Republican establishment. If the people don’t trust the government, tinkering with entitlement reform is like rearranging deck chairs on the Titanic. American legal institutions are consistently more liberal than those in Canada, and they are biased towards a privileged class of insiders who are better educated and wealthier than the average American. That’s why America has become an aristocracy. By contrast, Canadian legal institutions aren’t slanted to an aristocracy. The paradox is that Canadians employ conservative, free market means to achieve the liberal end of economic mobility. And that points to America’s way back: acknowledge that the promise of America has diminished, then emulate Canada. Oct. 20, 2016, 12:01 p.m.
My father told me only a few things that were useful. One was “It’s not what you know, it’s who you know. It seems that like Mr. Saut, being “connected” is much more important than when you and I were young. Connectivity of this kind is more the characteristic of an oligarchy than of the type of society and culture that the US is supposed to have. Are not the RNC and the DNC etc. merely oligarchic institutions within a larger potential oligarchy? Oct. 20, 2016, 11:17 a.m. There has been a “hollowing out” of our economy as formerly well-paying middle class jobs have disappeared through the combined impact of technology, foreign competition and a drive by so-called “job creators” to cut pay and benefits for any American workers left after they have out-sourced as many jobs as possible overseas, in order to “maximize shareholder value”. Meanwhile, our population continues to grow. The author talks about changes needed in our schools, legal system, government and immigration controls. While all of his suggestions have merit, it is hard for me to see how they will change the forces mentioned above. I suppose they may help “Sue” compete more successfully for one of the limited opportunities than she can in today’s world, but that will simply mean that “Judy” is the loser. That may make the Pew rankings look better if “Judy” is a child of the upper class, but what everyone is really looking for is a “rising tide that floats all boats”. That way “Sue” can move up economically, even while “Judy” also does well. Oct. 19, 2016, 3:09 p.m. I would like to have heard more about the author’s views of the Democratic party and its part in how America has lost its way. It seemed to me that he is saying that the problems the USA is having now all stem from the way the Republican party has screwed things up. I do appreciate his concerns and observations, even if I do not agree that they all stem from the Republican party. Until we as a nation admit that we have a real problem that will ultimately affect us all negatively, a non-revolutionary solution will remain out of our grasp. Would you please send this article to the 535 members of Congress so we can begin the process of awareness of how far we have fallen and an admission of our need to change?